In the 00s, Norwegian mainstream horror has grown and established its own scene, with Manhunt being the definitive highlight. While Norwegian horror films since the early 00s, when the current wave emerged, never managed to innovate or break new ground, many films have attracted great audiences and respectable reviews. Apparently, the films drew crowds that were not too much into horror before, crowds that didn’t find horror interesting until they could enjoy local actors and familiar environments. That, and the fact that any new local trend copies what the “big boys” did before, resulted in a horror film wave that was successful even if it didn’t represent anything new. American audiences, for example, are not interested in watching the same old slasher films over and over again, hence we got Saw and Hostel. In Norway, Manhunt (original title: Rovdyr, meaning ‘predator’) was a success but neither the story nor the effects were new to hardboiled horror fans. The film is set in the 70s, and opens as four 20-somethings are driving in the countryside, trying to find the remote place they are going to holiday at. At an isolated gas station/diner, they meet a girl who needs help, and when they try to help her, they are attacked by men who evidently are not happy about visitors from the outside. One after one they are hunted, killed, and slayed. In other words, a traditional story, even set in the 70s, a throwback to the gritty days of horror, like so many other movies. Granted, this is the first Norwegian horror movie that does the full 1970s thing, with costumes, cars and colours the way it looked back then. Possibly the first such horror film in the entire Nordic region. This is not just an hommage to horror films of the past, but it does in fact add something to the story. In a way, we expect people in the 70s to be more innocent and less smart than now, as times were more innocent then. Young adults had not been drenched in horror stories about serial killers in forests, and we therefore accept it when these people run into the woods or try to help someone they don’t know. It is also an age without cellphones. The general frame is therefore right. The story itself is quite traditional, so it is not that which makes the movie exciting. It is rather the intensity of the scenes, the no-nonsense action, the unapologetic brutal violcence. I believe Manhunt sets Norwegian record for graphic gore and deadly ferocity, such is the bloodsplatterede fate of the “teens”. It is unusal for a mainstream Norwegian movie to go this far, and kudos to the team for daring! Technical excellence is not the only good part about this film. As the group is hunted and killed one by one, they must make difficult decisions about who to save; themselves or their friends? When it really matters, what do you do? If this is a comment about the accelerated difficulty of modern society in terms of chasing a better lifestyle and being part of the right group at the cost of others, then Manhunt makes a good and clear point. Casting can make or break a movie, and in Manhunt this is solved by using mostly unknown actors, except for Henriette Brusgaard. Their effort ranges from good to excellent, with Brusgaard shining in the lead role as Camilla, the beautiful girl who sees most of the action. Brusgaard beams great screen presence and has great cinematic looks of international scale. Why has she not been picked up by Hollywood yet – she would make a great scream queen! The other actors are somewhat hindered by a script that is weak in the dialogue department, but most of the film does not have much dialogue, so it is isn’t really a problem. This is no doubt an action driver film, which excuses the somewhat shallow characterizations in the beginning of the film. Other critics have ridiculed the movie for being too classic, too traditional. There is nothing here that suggest that being original was the core idea of the film. 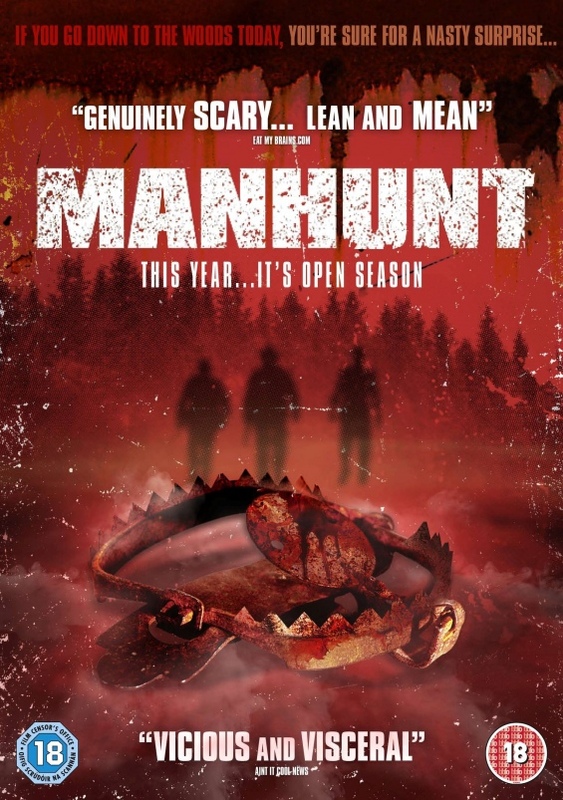 Manhunt succeeds in what it tries to be, which is a traditional slasher film, set in the woods. Except that it is a Norwegian version of all the old American slashers-in-woods movies. When the pretension is to not really have any pretensions, you can’t fault the film for not having any pretensions. Starring Henriette Bruusgaard, Lasse Valdal, Nini Bull Robsahm, Jørn-Bjørn Fuller-Gee, Jorunn Kjellsby.